Flush Fitting Locking Sash Jammers have become a popular product here at Spares 4 Repairs. With the ever-rising popularity of the composite door, due to the diverse range of colours and styles available, also the trend towards timber windows increasing the question we often get asked is "what if I want to increase my security?" Now we have the answer, our flush fitting locking sash jammers are easy to fit at home with only basic tools required. We have a flush fit sash jammer with key lock that is available in white or brown, this sash jammer comes complete with packers if you do have a small overlap, fixings and key are also included. These versatile flush fitting locking sash jammers fit composite, aluminium and timber doors, as well as timber windows. Sold individually it’s one of the easiest ways I can think of to increase your home security and give you extra peace of mind. 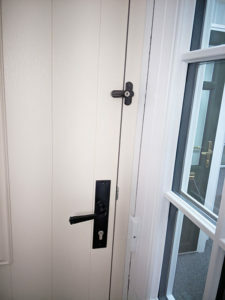 As you can see our Flush Fitting Locking Sash Jammers look great on any door. These usually sell at £9.26 but for 1 week only 18th - 24th January these can be purchased direct from Spares 4 Repairs for just £7.85, saving over 15%. Purchase Flush Fitting Locking Sash Jammers from our online store today.